G-merl and Egg Hammer 3 (エッグハンマー3 Egguhanmā 3) are the first two bosses of Sonic Advance 3, both fought in Route 99's boss Act. First, you're faced off by G-merl for the first time. He simply moves left to right and back again across the screen, and can be defeated by attacking him 4 times (or twice on the game's Easy setting). After G-merl's defeat, you'll face the first Eggman boss of the game. This boss continues the Sonic Advance tradition of a hammer-styled boss to begin the game, following the doctor's previous attemps with the first and the second Egg Hammer Tanks (as such, it is often affectionately referred to as the "Egg Hammer Tank III", despite not having an actual name). 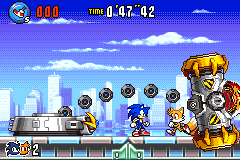 The boss is stationary, the hammer (and Eggman's cockpit) moves downwards left or right, stretching to whack the player where they are standing as it does so. If the player stands directly under the hammer, it'll come crashing down on them. These attacks are easily avoided, and Eggman can be goaded into swinging to the left or right to make the cockpit easy to hit, and thus can be defeated in the standard eight hits (six on Easy). Once defeated, Eggman will flee and the player will be spirited away to the orange landscape that is Sunset Hill. Also of note is that G-merl, harmless and stationed in the base, follows the player to whichever side of the screen they are on. This page was last edited on 18 March 2018, at 12:35.